The Alphard MPV provides superb every day family transport plus the perfect day van environment - truly, a Multi Purpose Vehicle. The Toyota Alphard (the name comes from the star Alphard, the brightest in the constellation Hydra) is a pre-owned luxury 7 or 8 seat people carrier. First introduced onto the Japanese home market in 2002, reassuringly it continues in production to the present day, earning it the accolade of being one of Japan’s best selling MPV’s. With it’s compact dimensions - surprisingly, only the same size as an everyday family hatchback, the Alphard truly is a go anywhere MPV. Equally at home negotiating town centre bustle as it is effortlessly cruising the motorways this spritely performer won’t disappoint wherever you find yourself. And parking isn’t a problem thanks to easy power steering, parking sensors fore and aft plus colour cameras front and rear on most models. With an impressive output of 160PS from the 4 cylinder 2.4 litre 16 valve engine there’s plenty of performance. For even more get up and go the 220PS V6 3 litre 24 valve engine offers limousine style power with grace and elegance. Couple the super-slick 4 speed automatic gearbox with lithe, nimble footed handling and you’ll be eating up the miles with ease. As Imperial Leisure Vehicles specialise in sourcing the highest grade, lowest mileage vehicles many Alphards we import are of a higher than normal specification, complemented by many other luxury bonuses. Equipment levels are exceptional, every function being electrically operated and power assisted. You would naturally assume electric windows, electric retracting mirrors, central locking and power steering come as standard. Add to this list the possibility of remote electric sliding passenger doors, remote opening and closing electric tailgate, twin electric sunroofs, Alcantara suede upholstery, cruise control, front, side and rear curtains, dvd player with theatre surround sound, room lighting and privacy glass and the Alphard takes you to new heights of luxury. And as you would expect, all Toyota Alphards are fitted with a host of safety features such as airbags, ABS braking systems, parking sensors and some even with lane assist systems. Adaptable seating ensures the Alphard copes with any eventuality. 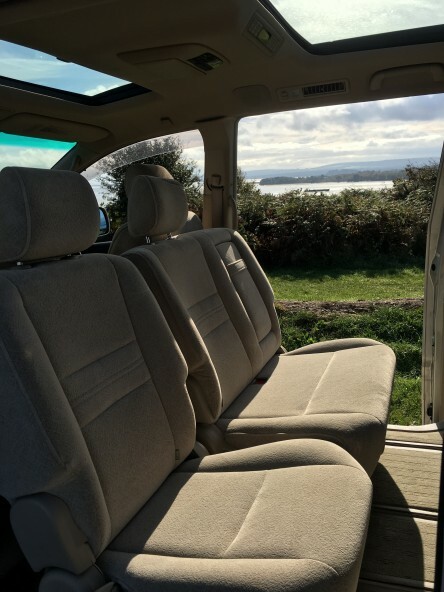 Seven seat models come with two individual middle seats plus further accommodation for three in the rear, as well as the driver and front passenger. Eight seaters carry three passengers each in both the middle and rear rows. All seats adjust fore and aft to suit the longest legs and recline at the pull of a lever. Pull a second lever and the middle seat-backs fold forward to form a useful table. When load carrying is a priority the rear seats easily fold up sidewards to create a cavernous boot, whilst still leaving ample seating for five. To add even greater flexibility, the middle seats spin round to face the rear. Despite the many variations in seating positions no concessions have to be made on passenger safety. Outer middle and rear seats benefit from 3 point seat belts, with lap belts fitted to to the centre seats. 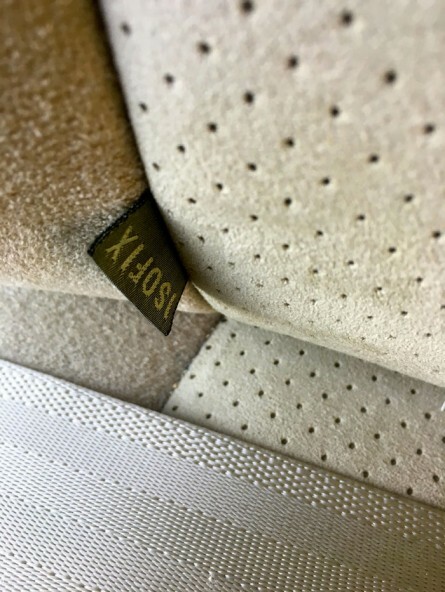 Add to that two integral ISOFIX mounts, the internationally standardised child seat fitting system, as well as integral lap belts for when the middle row is rear facing. Fold all the seats down and, with a mattress topper, you can even stay out overnight. Such variety creates superb family transport plus the perfect day van environment - truly, a Multi Purpose Vehicle.